Where an appropriate petition for derivation has been received by the Board, the Board will enter a notice into the respondent’s application or patent file, if it has issued. When the examiner has determined that either the petitioner’s or the respondent’s application (where applicable) has allowable subject matter with respect to any claim, the examiner should refrain from taking any further action until consulting with the Technology Center Practice Specialist (TCPS). 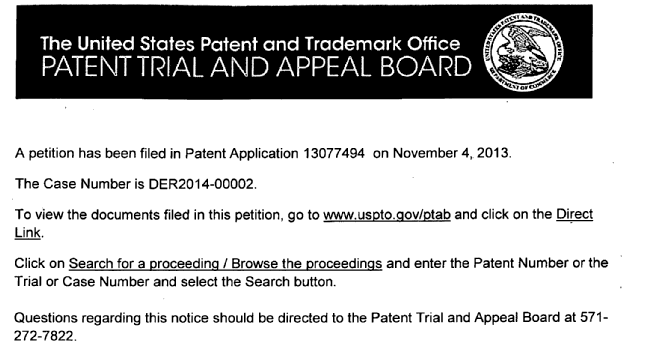 The claims in petitioner’s application that are patentably indistinct from respondent’s application or patent should be subject to a rejection under 35 U.S.C. 102(a)(2) which should be maintained until jurisdiction is transferred to the Board to conduct the derivation proceeding. An example of the notice added to the respondent’s application is provided below.